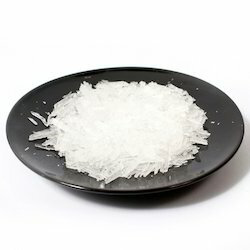 Our range of products include menthol crystal. 100% Menthol Crystals are generally produced through extraction of peppermint oil or other mint oils. Menthol is a waxy, crystalline substance which is generally white in color and solid at room temperature. Known for characteristic odour, this crystalline substance melts slightly above room temperature. By subjecting the distilled menthol oil to a temperature of -22° C, menthol crystallizes out into solid crystals. Known for their strong aroma, cooling and refreshing effect, the menthol crystals are generally used in preparation of cosmetics, salves, balms, medicated creams, throat lozenges, toothpaste, mouthwash, gum, foot sprays, pain relief or cooling body products, shampoos, conditioners, liniments, shaving creams, oral or throat sprays, compresses, medicated oils, and cooling gels. For relief from muscular pains, sprains, cough, congestion, flu and upper respiratory problems, menthol crystals are the excellent sources.